Lake Tanganyika, the second largest in the world in volume and the second deepest, borders four countries, but it is at its southern end, in Zambia, where the species Neolamprologus obscurus lives, small freshwater fish with rays that They feed mostly on prawns and other invertebrates that they find in the depths. At night, the crustaceans move towards the water column but sink back into the bottom of the lake at dawn to hide in wells and pits, including the shelters that the fish have excavated under the rocks. In these hollows, the prawns become trapped and become the prey of N. obscurus. “The function of these excavated cavities is very similar to that of social spider webs, which live in groups and share the prey caught between the different members of the group,” stresses Hirokazu Tanaka, lead author of the study published in Behavioral Ecology and Sociobiology and researcher at the University of Bern in Switzerland and at the University of Osaka City in Japan. The work has allowed determining how the digging of these holes is done, which serve as a trap to capture the shrimps. According to the scientists, excavation is always done in a group, as well as its subsequent maintenance. Breeding females do not leave the safe shelter and have family support or helpers to protect the young and extract the sand that enters the holes. To confirm this behavior, Tanaka’s team checked whether the size of the cavities at the bottom of the lake was related to the abundance of food available in the area and whether the presence of the helpers influenced the size. After spending several hours diving, the scientists created artificial cavities and analyzed the stomach contents of the fish. In another experiment, the biologists removed the aides who were assisting the females. After a week, so much sand had entered the cavities that their size had been reduced, especially in the case of holes with larger helpers. 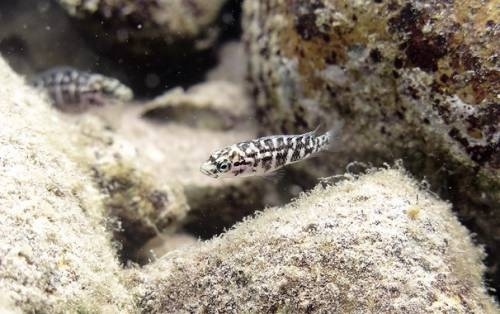 The results confirmed that the size of the refuge of the fish in the rocks influences the amount of shrimp that hide and become trapped in it. With a larger number of helpers, the space that can be created is larger and therefore more crustaceans can be captured. “The assistants enlarge and maintain the excavated cavities, and in doing so, contribute to an increase in the abundance of food within the territory of the breeding females,” says Tanaka, for whom the group life of this species increases the number of prey, as well as the corporal conditions and the reproductive success of all the individuals.